The object of these events, easily smothered by loads of technique, is to “put” the shot or launch the jav as far as possible. Anybody who has at least attempted a throwing event can attest to the extreme technicality of the sport. Especially when you’re not sure what hand to hold the implement in! 1992 – Aged 5: broken right wrist. Perhaps reinforced left-handed dominance in basic activities? 1993 – T-ball: would catch with right hand and throw left, but would occasionally catch, frantically discard right-handed glove, and throw with right hand. Bat right. 1996 – Recreational tennis: generally would hold racket in left, but would often juggle racket to right instead of hitting a left-handed backhand. 2001 – Houseleague hockey: played right wing with a right stance. 2002 – High School Volleyball: would serve overhand left (just over the net), avoid spiking altogether. 2005 – Begin throwing shot and javelin: left-handed (unnatural, to say the least). 2008 – Shot: shift technique from glide to spin (a little better?). 2009 – Shot: RIGHT HANDED!!!! 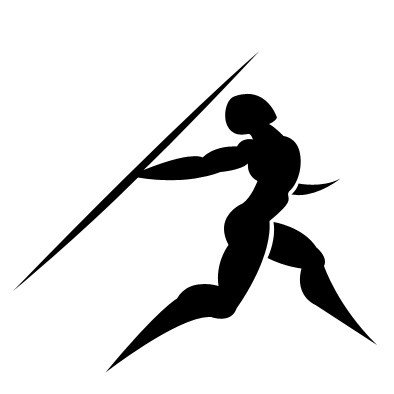 2010 – Javelin: RIGHT HANDED!!!! Last week – Learned a secret: flick your wrist! Everything makes so much more sense when I throw right. I can feel power and transfer of energy (whether I can fully harness it yet or not). Further, I can see myself throwing right-handed in my mind’s eye…I am excited! I’ve been desperately trying to think of a good analogy for the all-important kinetic link, bouncing ideas off my mom and grandma (everything from pirates to trains to synchronized swimmers) and getting uncomprehending stares in return. But UWO’s Bob Vigars provided me with just the ticket in his biomechanics lecture that I attended this morning: crack the whip. Although we never tossed people into fences as Bob said was a regular pastime in the school yard in his day, this game satisfied, or perhaps developed in me a need for speed at a very young age…and is a key to throwing success. We played it on skates, where a line of people join hands and build a little momentum before the lead person turns sharply or stops. The links between everyone start to strain as the momentum continues to carry the second, third, fourth and remaining people around in a wide arc, the person on the end usually flying off on a tangent when their hand can no longer handle the strain! Bob explained that as each person stops in sequence, their momentum shifts to the remaining people, compounding and resulting in extreme acceleration. This is exactly the case in throwing. Momentum is built, then each body part stops in sequence: foot, hips, trunk, shoulder, upper arm, lower arm, and eventually the hand whips through. I believe my issues with throwing lie in achieving this kinetic link. This isn’t new news, but I feel more empowered to make a change with the new understanding of precisely where I am lacking. Firstly, when I throw many key movements occur at once, when they should happen in sequence. The most apparent are the rotation of my hips, trunk, and shoulder. Second, when I do achieve some separation, I don’t stop my body parts. Without sufficient blocking (as the throwing world calls it), the hip will come through, pulling the trunk and shoulders, but if the momentum remains with the hip as it continues rotating, it will not compound and shift to the arm. In this case the throw will be as a result of centripetal forces, without the added acceleration that comes as a result of work put in by the bigger muscles of the legs and hips. So, sequence and blocking. Easy. Also, I highly recommend attending cool lectures whenever possible! Many institutions host lecture series open to the public, and really, nothing is stopping members of the community from walking in to just about any classroom on campus.